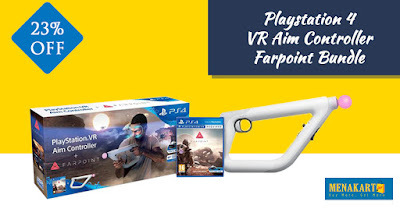 Online Shopping in Dubai: PlayStation 4 - VR Aim Controller Farpoint Bundle. PlayStation 4 - VR Aim Controller Farpoint Bundle. Farpoint is a riveting VR space adventure set on a hostile unknown planet. Feel the action with PlayStation VR Aim Controller’s precise motion tracking and deeply intuitive controls as you are transported to this unnerving alien world. PlayStation VR Aim Controller heightens the experience of any compatible shooter for your PlayStation VR. Precise motion tracking, ergonomic design, and deeply intuitive controls keep your shots lightning fast and deadly accurate. Together with vibration feedback, the Aim Controller lets you feel the action as you are transported to incredible and unexpected gaming worlds. PlayStation Camera (sold separately) required for PlayStation VR and PlayStation VR Aim Controller functionality. Separated from your colleagues, you must use holographic logs scattered throughout the landscape to reunite with the scientists and escape the planet. Farpoint, a riveting VR adventure set on a hostile unknown planet, was created exclusively for PlayStation VR and developed alongside the PlayStation VR Aim Controller. On a mission to pick up scientists studying an anomaly near Jupiter, a sudden rupture nearby sends you and their station crashing onto an unknown alien world. Feel the action with PlayStation VR Aim Controller's precise motion tracking and deeply intuitive controls as you are transported into this unnerving situation. Farpoint, together with the PlayStation VR Aim Controller, sets a new standard for FPS gaming.